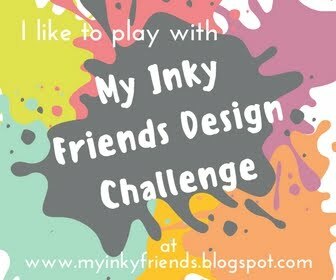 It’s time for another Inky Friends design challenge. We picked a color combo from page 63 of the 2017-18 Stampin’ Up! annual catalog. This is a great color scheme, perfect to get in the mood for summer. The colors are very bold, so I chose to use them in moderation to let them shine. I used the NEW Varied Vases set (designed by Stampin’ Up! Million Sales Achiever, Mary Fish). I LOVE this set. It even has a coordinating punch! For this challenge, I decided to go a bit minimalist. I masked the center vase so it would look like it is in front. The fun scallop line makes a great shelf for the vases. A few enamel dots compliment the trio of vases. I stamped the Hardwood background stamp in Bermuda Bay. I stamped it off first to mute the color just a bit. The front panel is raised with Stampin’ Dimensionals for more depth. Thanks for stopping by. I hope you will drop by the Inky Friends blog and play along with our color challenge. It’s more fun when others play along. Create a project using this color scheme and upload a link to it on the Inky Friends page. Happy Stamping! My Inky Friends are back with another Design Challenge. This one is based on a card layout on page 35 of the 2017-18 Stampin’ Up! catalog. I decided to use the Coffee Cafe set and added the “coffee” from Balloon Celebration and the coffee rings from Timeless Textures. The Wood Textures circle is cut out with the Stitched Shapes Framelits, the stitching is hard to see on the dark wood paper. For the Pear Pizazz piece under the Thanks a Latte oval, I went over it with my bone folder to break the fibers. Next I peeled the paper into two layers. The piece now has a soft, fuzzy look. I hope you go check out the other great creations based on this sketch. Thanks for stopping by! Happy Stamping! I can’t believe it is April already. Spring is coming – well, eventually. Unfortunately, Minnesota didn’t get the memo. We had snow last Friday and more is coming this week. UGH! Enough already! At least today’s cards have a springtime feel to them. They spotlight the Petal Palette stamp set and coordinating Petal Passion DSP in the Occasions catalog. I used the same colors and layout for these cards. I changed up how color was added to the DSP and the sentiment. The black and white prints of the dsp offer great versatility for your projects. Add in a pop of color (Calypso Coral for these) and you can customize the DSP to you project. For the card on the left, color was added to select flowers in the DSP with a blender pen and ink in the lid of the ink pad. The card on the right, I stamped one of the flower images int he Petal Palette set in Calypso Coral to give more depth to the DSP. Try customizing your DSP. It’s a lot of fun and adds a fun element to your project! Thanks for stopping by! Happy Stamping! I’m back with my Inky Friends for another design challenge. This time it’s a color scheme found on page 79 of the 2017-18 Annual Catalog. I used Lots of Lavender set with the addition of Basic Gray for the outline and sentiment. Stop by the Inky Friends blog and see what the other designers created with this color scheme. There really is a lot you can do with it! Then play along and share your creation.